This is a dangerous book to read when one is already contemplating leaving their boring desk job to do something more active/creative/tactile. Talk about cultivating discontent! (Also, I realize that my desire to do this puts me yet again in a trendy-weird named cultural demographic – YUCCIES!) In the end, I am staying put, but now have the ability to reference deeper philosophical reasons for my desire to change careers. The book was great, but I wasn’t necessarily the audience. 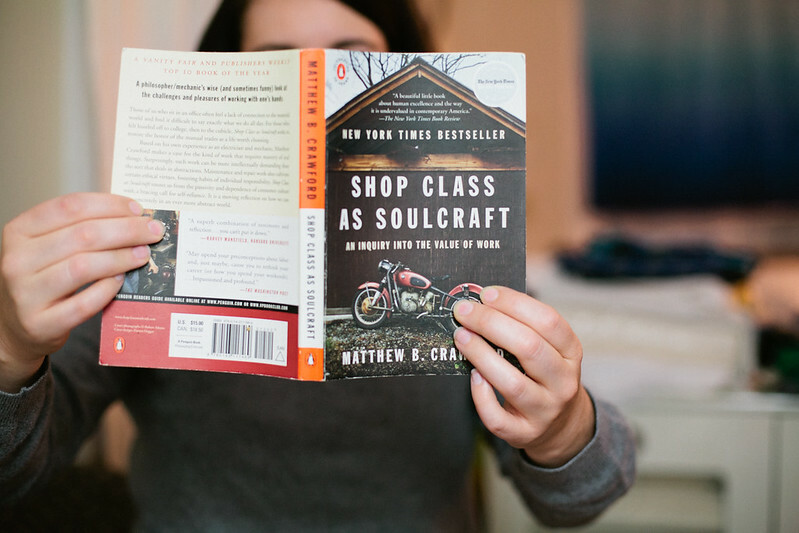 I did find myself wanting to ride/repair motorcycles (ahhhhhhh empathy) and I also had a desire to write a version of this book that talks about the value of textile craft (I’ll probably not do that). At one point, Crawford started poking fun at corporate management/teamwork theories, and since I find those both intriguing and useful, I felt like his criticisms weren’t based on much more than “these people look silly doing this in a business suit.” So, again, maybe I just wasn’t the right audience. I just picked this up on my kindle. It’s a lot … heavier than I was expecting and I’m only on the first chapter. Should I persevere or is life too short? Oof. It’s a philosophy book. It’s an interesting, readable philosophy book on a topic that you’re going to enjoy. But it’s going to have the same weight the whole way through.